When I was thinking about adopting Isis Kerry explained in detail all of the little dog’s problems. She also told me that Isis is a brave little dog. And she is. In the morning when the sun is bright and low in the sky she is terrified of walking into the stripes and I carry her around the most scary bend in the path. But the rest of the time she faces the dangers. When the sun is low or the wind is strong she cowers as she approaches trees and bushes. “It won’t fall on you,” we tell her, although, of course, she can’t hear us. Her body close to the ground, she creeps past the hazards, staring upwards apprehensively. Safely past, she straightens up and carries on as normal. She is afraid of the park lights. For weeks she refused to walk past them. Even when I carried her she was apprehensive. She is still nervous of them and watches them very carefully but she braces herself and walks on. She has obviously been through many traumas in her short life (she is only two). But she is learning not to be afraid of most situations. 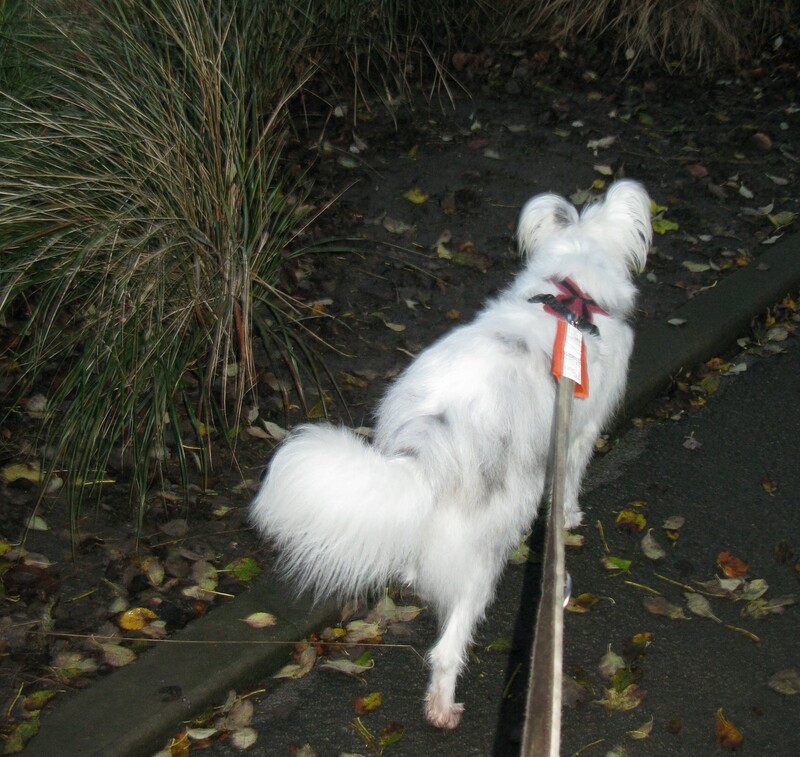 This entry was posted in deaf/blind dog, walking in the park, walking my deaf/blind dog, we don't like bright sun, we don't like the dark and tagged blind dog is brave, blind dog triumphs, deafr/blind dog. Bookmark the permalink. Hi. That would be lovely. Thank you.